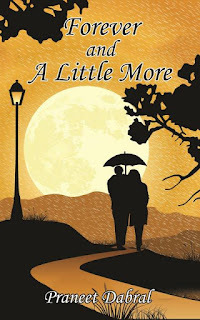 After reading ‘Forever and Little More’ by Praneet Dabral, it becomes difficult to predict whether the novel falls in the genre of romance or some other category. It seems a cute love story, but there are elements of sadness and tragedies in it. It seems a biography of a lover, well there is more to that. On the other hand, the author has made it a riveting read by mixing two techniques simultaneously – flashback and biography style. Tanish Cainthola is the protagonist of the novel. His story, mainly a love story, shuttles between two times i.e. 1977 and 2012. Basically in 2012, he is brooding on the events that happened in 1977-78. He returns to his hometown Snowdon after 34 years from Mumbai. He is frustrated with himself for many reasons. In the attic, he finds a broken bat and a diary which once was written by him. The diary is mainly about his love affair with Jessica Jones in the winter of 1977. It has been long that he has kept his past suppressed but this time he finds hard to control himself, thus he begins reading the diary. Tanish meets a beautiful girl, Jessica, stranded in rain one night. He helps her to reach her home. Soon he comes to know that Jessica is a daughter of Mr. Jones, whose window pane he recently broke. They meet, talk, and walk together to the riverside and to some amazing places like Paradise Land. A typical adolescent romance begins taking place between two of them. Their love for each other almost cements when they attend a carnival together and thereafter miss the bus back to their town. Apparently, they are in love. But who is going to propose first, is the concern? Finally, Tanish decides a day to propose her. When he takes her over a beautiful spot for proposal, he fails to express his love. Rather that time he comes to know that her father, Mr. Jones, has been diagnosed with cancer. This is the turning point in their love affair. He tries to lift her spirits up. Next, Jessica and her father leave for Bombay for treatment. Now what next? Will she comeback for Tanish? Or Tanish will go there to bring her back? How will they confirm that they were in love, as neither of them expressed? There are many questions that seek answers by the time readers reach the end of the novel. However the ending is not what everyone expected…it is quite different from normal love stories. Once you get to know what had happened to that girl Jessica and the lover boy Tanish, your heart may break down. You, as a reader, probably will take time to come out of it. Written in very simple language, it is a terrific story of romance and heartbreak. Kudos to author Praneet!